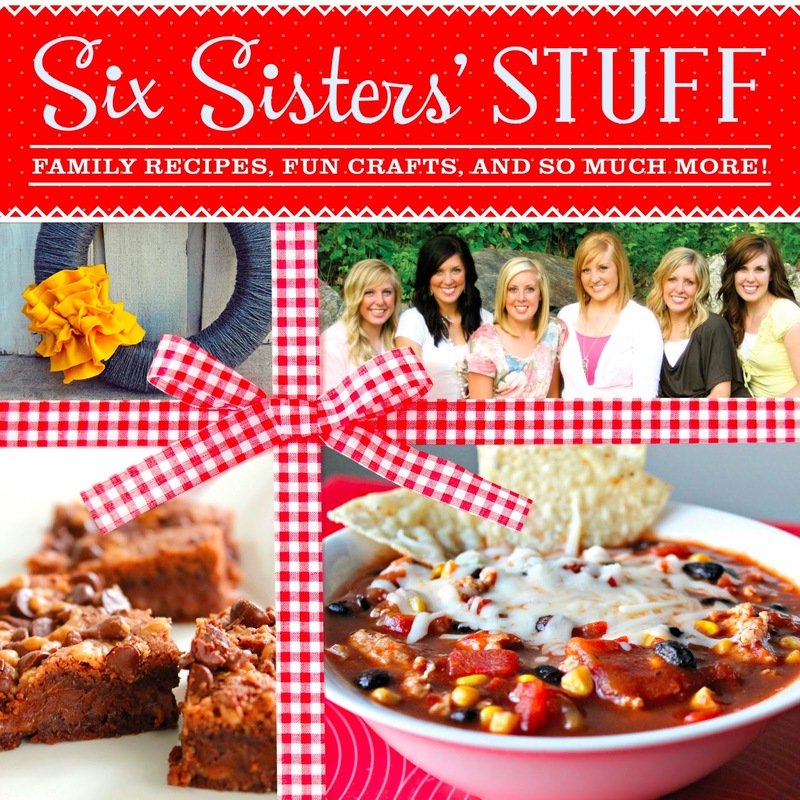 Six Sisters STUFF blog created a cookbook full of family recipes, fun crafts and so much more! If you need something new and exciting to jazz up your home then this crafty, fun filled cookbook is for you. I've been a huge fan of Six Sisters' STUFF blog for over a year now. They don't know it but I consider myself to be their long lost 7th sister. I love everything they post and have made many of their recipes. I have pinned a lot on Pinterest that I plan to try in the future. I jumped for joy when asked to review their new cookbook which was released March 4th. Here is a walk through of their cookbook with just a few of my favorites. The Sisters make getting food to the table seem so easy. Besides all of the easy-to-make tasty recipes, the book is full of crafts and homemaking ideas which encourage families to create memories together. This book would make a perfect gift for any new bride, new mom, daughter headed off to college as well as a sweet birthday gift for a girl friend. I loved all of the photos. 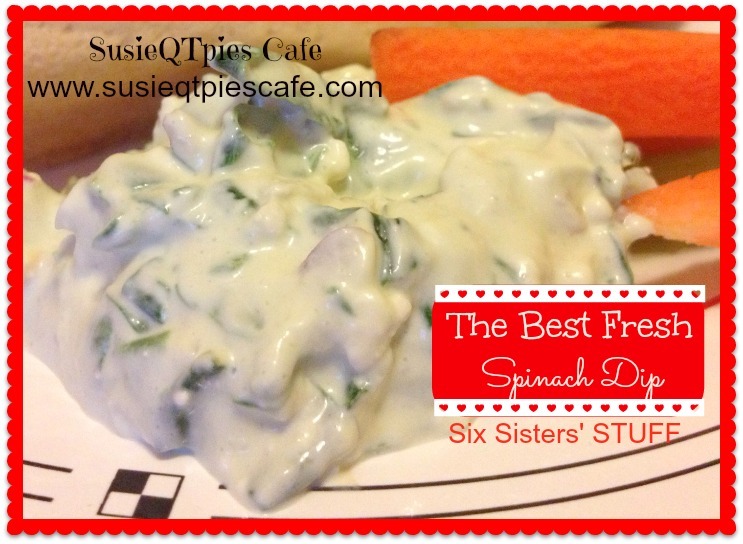 Just like on their blog, Six Sisters' STUFF, the photos rock each recipe. Everything is drool worthy! This cookbook is innovative because it truly connects their website to this cookbook. I've seen quite a few of the recipes and crafts on their website which gives me comfort because I know that their ideas work! I love how they have QR Codes sprinkled throughout the book to link ideas right back to their website. That is brilliant! I promise you that you won't get more than 1 email a week, if not just a few a month. I'm going to use the newsletter to offer special giveaways only to subscribers. If you aren't sure if you are a subscriber, just enter your email in the box below. You have to make sure that you confirm that you want to receive the newsletter in your registered email. Leave a comment to tell me the first part of your email that you subscribed. You don't have to leave the @gmail.com,etc part. 2) Click the 4x4 Family dinner banner on the website www.SixSistersStuff.com (on the right sidebar) and leave a comment that you are joining the challenge. 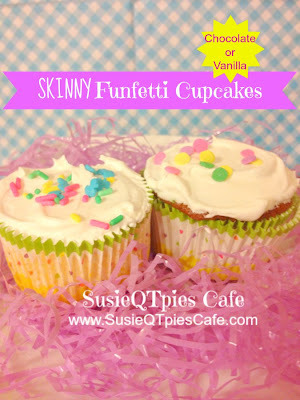 3) Follow my Pinterest Boards and leave a comment with your Pinterest ID (Leave the entire thing link http://pinterest.com/susieqtpies) so that I can follow you back. 4) Go check out the Slow Cooker Pot Roast Sliders recipe from this cookbook. Leave a comment on that post and one below to get a bonus entry! 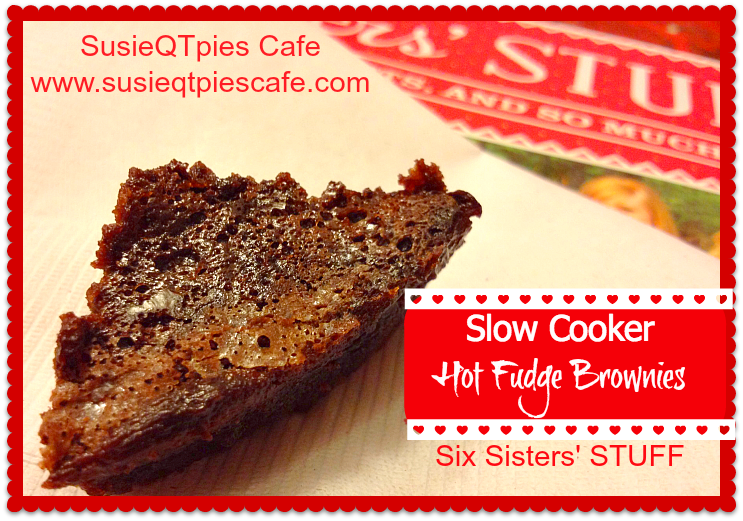 5) Go check out the Slow Cooker Hot Fudge Brownie recipe from this cookbook. Leave a comment on that post and one below to get a bonus entry! 6) Go check out the Skinny Funfetti Cupcake recipe from this cookbook. Leave a comment on that post and one below to get a bonus entry. Disclosure- I was given a copy of this cookbook to review. My own tasty opinions are stated here. I am a fan of Six Sisters Stuff on facebook. I also went to their site and left a comment that I'm joining the challenge! I'm a subscriber. Forgot to put email previously. elaine1255. Thanks. Clicked on the banner and left a comment on Six Sisters Stuff website! I subscribed with beth.a.b email. I left a message on the Six Sisters Stuff page for the 4x4 challenge. I signed up for the dinnertime challenge and commented previously. We love dinnertime at our house, not only for the food but for the family times! Love this challenge! I am a facebook fan of theirs and commented also. Thanks for the chance to enter. I did comment on their 4 x 4 Family dinner challege. Thanks for the chance to enter. 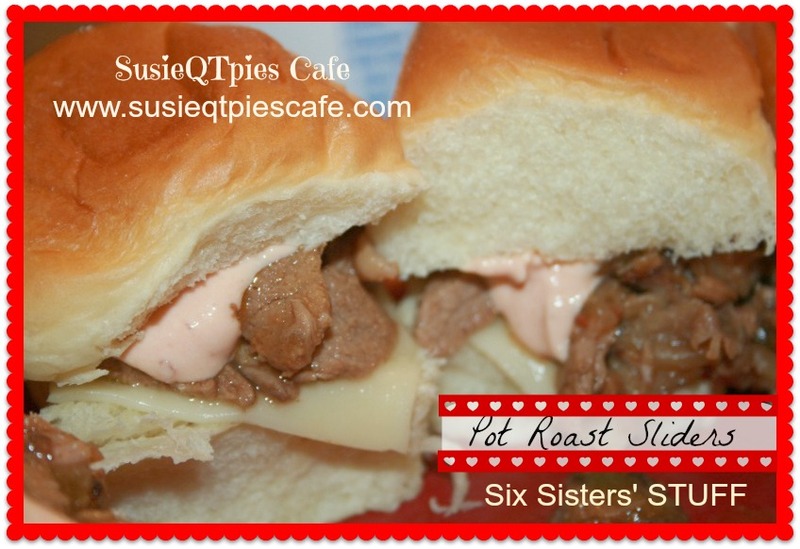 Their recipe for the pot roast sliders looks awesome. Thanks for the chance to enter. Love Six Sisters, and LOVE you too Susie! What a great idea, and the cookbook looks amazing! Commented on the sliders recipe post! I commented on the roast beef sliders post for another entry. Thanks. I commented on the brownies post for another chance to win. Thanks. Liked Six Sisters Stuff page and commented! Six Sisters is such a great blog! I'm so excited to see that they've published a cookbook! I have subscribed to your new newsletter. I left a comment on the Pot Roast Sliders post. I left a comment with the Six Sisters that I'm joining the challenge. Why Celebrate National Food Holidays? What are some of your favorite Messy Kid Moments? National Peanut Butter Lovers Day Recipes!